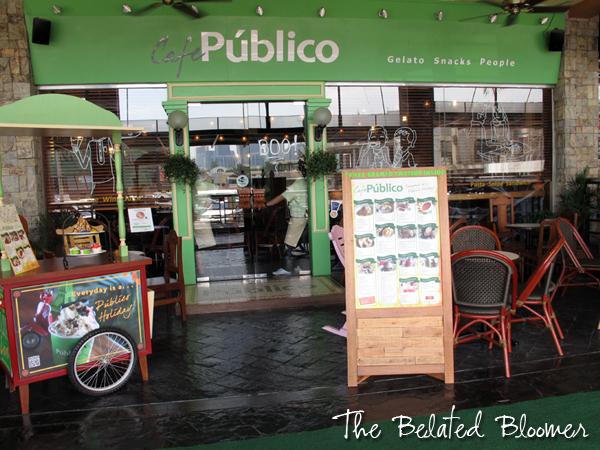 Partially hidden on the second level of Greenhills Promenade, one can find Cafe Publico, a quaint restaurant with an warm, inviting, Tuscan-inspired vibe. 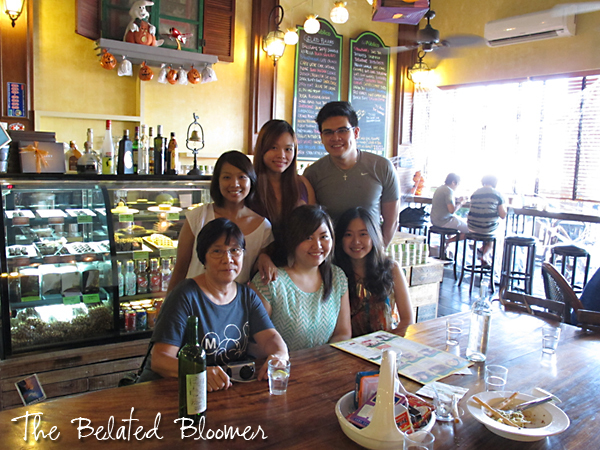 My friends and I found it perfect for a Sunday lunch meet-up with its offerings of pasta, sandwiches and best of all, gelato. 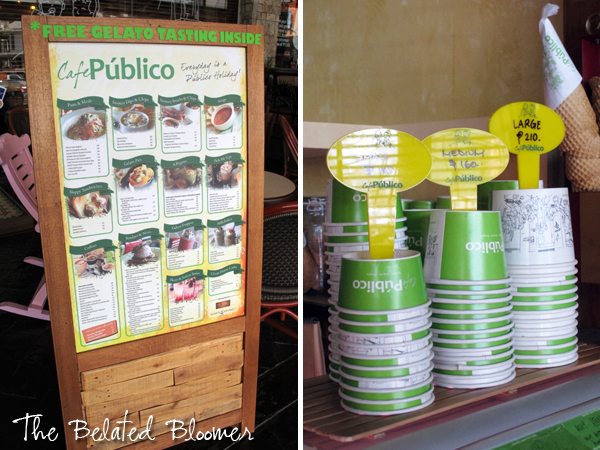 Who can resist a free taste (make that free tastesss) of different flavored gelato? 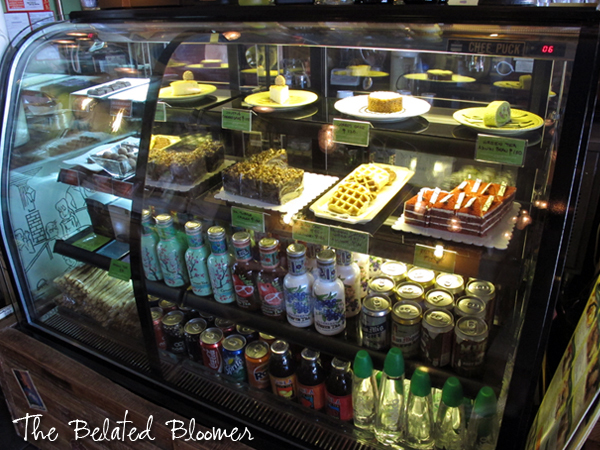 The display counter showcases different options for desserts and drinks. 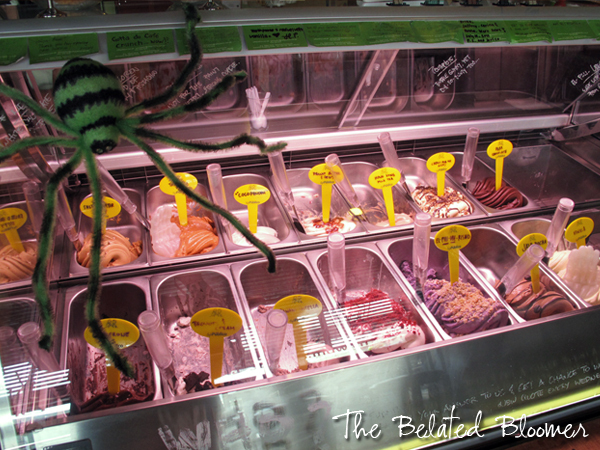 I prioritized their gelato though, as this is what they are known for. Yes folks, I believe I've found the giant doorway to Narnia. 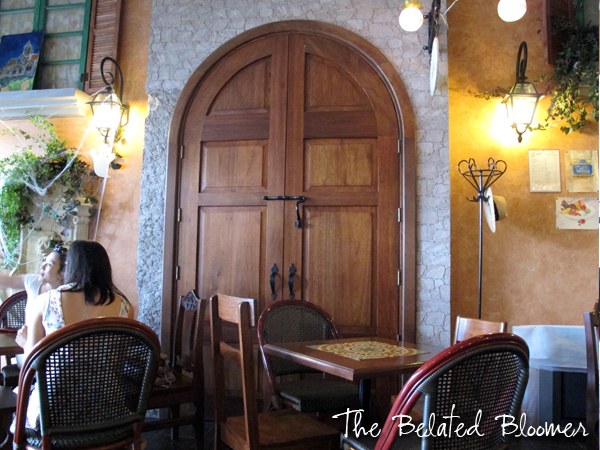 I love the decor of the place and the way the sun filters through, giving the cafe a homey ambiance. My order of Shrimp Tarragon Ravioli in Bacon Cream (p260) was composed of flavor-packed pasta envelopes that made me swoon at first bite. It's quite rich, so I'd suggest sharing with a friend but if you're a cheese aficionado, then go ahead and enjoy this bacon-y offering. My friend ordered the Meatballs and Cheese sandwich (p285). 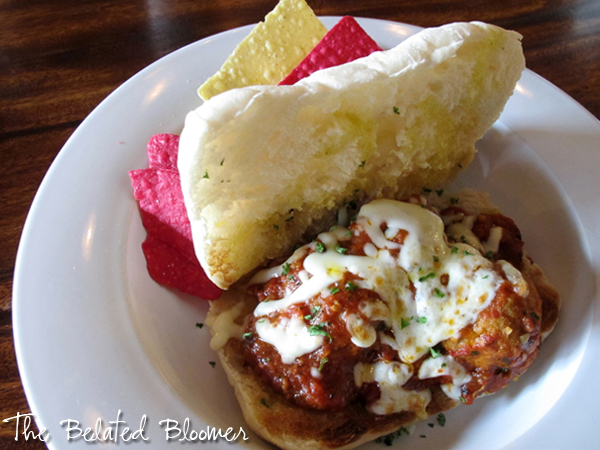 It's a split Ciabatta bread covered in what I would assume to be marinara sauce and then topped with two gigantic meatballs and mozzarella cheese. All I can say is that it's rightfully categorized under "Sloppy Sandwiches" because you'd have a hard time eating this with poise without using a fork and a knife. 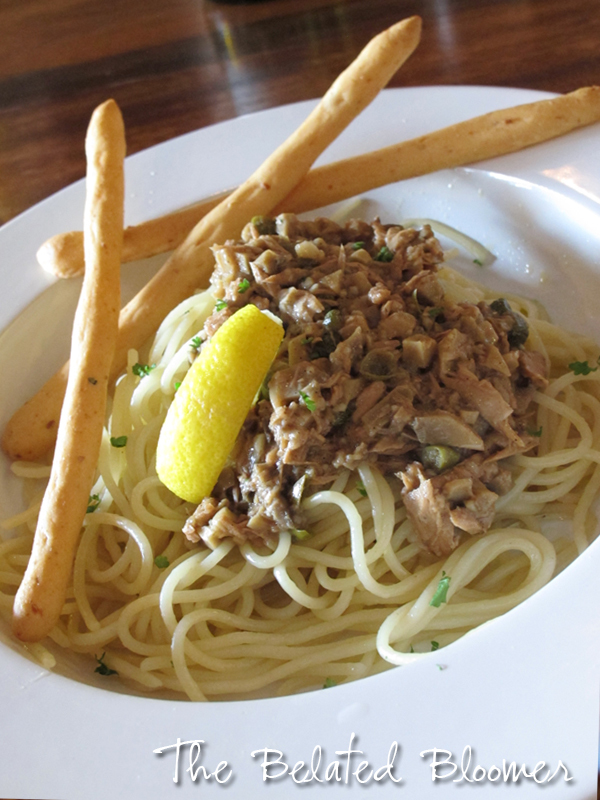 This is the Spicy Tuna Spaghetti in Olive Oil (p280). My friend said it was okay, just okay. I didn't get to taste this though. 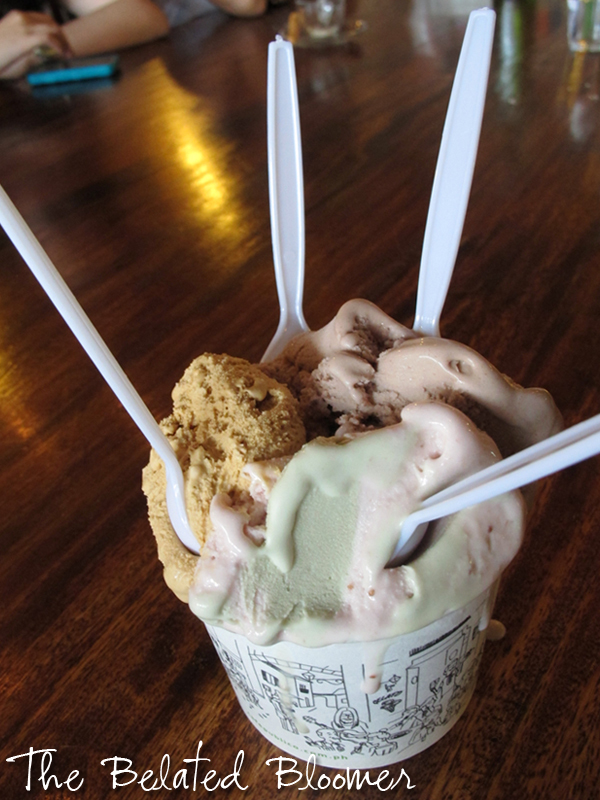 The three of us girls, still with rooms in our tummies, decided to order the big cup (p210) and try out 3 flavors. My best friend says she dreams of their Salted Butter Taffy gelato so we ordered that, along with Banana Hazelnut and Sophia Loren (quirky name for Pistachio and Strawberry flavored gelato). All three were spot on with their flavor combinations, which were neither too sweet nor too cloying. And the somewhat steep pricing is justified by the use of top-notch ingredients. There we are, a bunch of sated and happy people ready to spread the word on gelato goodness. 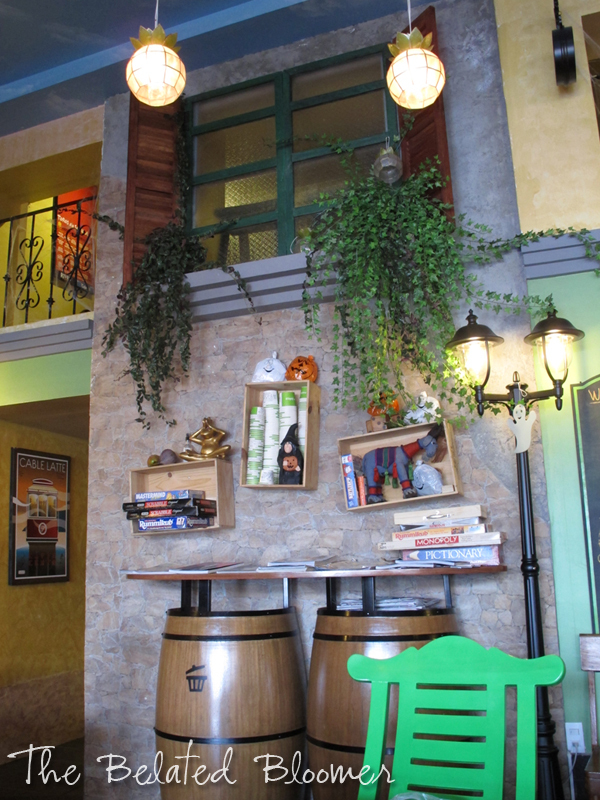 the place looks lovely and I'd like to have a slot for the free gelato taste!! Just go in and point at the flavor you want. At around the third time though, you'll feel a slight blush coming on and a need to buy a cup. Haha! 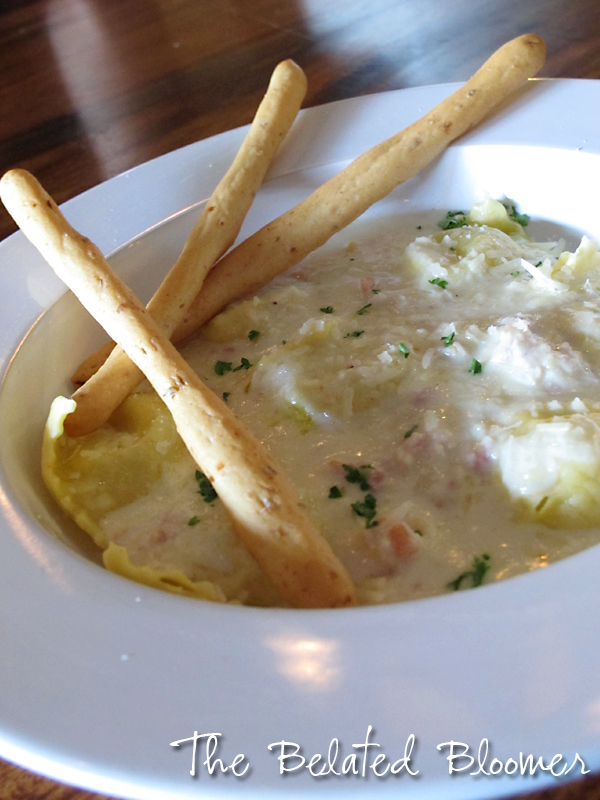 Mmmm the ravioli looks so good! Oh my, all that food looks AMAZING! You just got me hungry! And it seems as a nice place to hang out with friends!